The goal of the Chasing Einstein Challenge is to work to become a creative and persistent problem solver. Over the course of eight weeks, students will work together as teams to earn points by completing weekly math challenges. Each team will be guided by a college student from DSU that will serve as their Math Mentor. 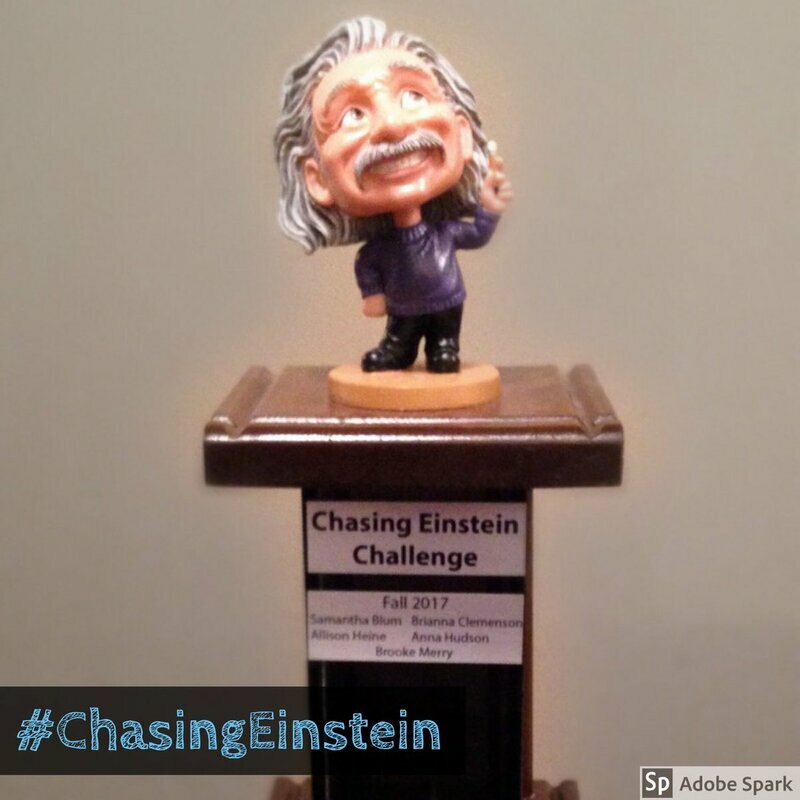 The team with the most Einstein Points (EPs) at the end of the eight-week challenge will be crowned the Chasing Einstein Champion and will have their name emblazoned on the coveted Chasing Einstein trophy. Chasing Einstein is about becoming a creative and persistent problem solver. Working hard and having a positive attitude are much more important than speed! Students will earn Einstein Points (EPs) for their attitude, effort, progress, and videos during Chasing Einstein. The goal is to earn as many EPs as possible. The team with the highest average of EPs at the end of the eight week challenge will be crowned the champion. Attitude​ & Effort - during Chasing Einstein the classroom teacher will be observing students for their attitude and effort. Students will earn more points for having a positive attitude and putting forth a lot of effort. The classroom teacher will fill out a scoring sheet at the end of each week based on students' attitude and effort. Math Challenge Progress - each week students will have math challenges to complete. At the end of the Chasing Einstein class period, students will share their progress with their teacher. The classroom teacher will record the results. The more progress students make, the more EPs they will earn. Remember, this isn't about speed, so students shouldn't try to be fast. Students should work to stay on task and persevere when they get stuck. In addition, teachers also know that everyone learns math at a different pace. The most important thing is to strive to make progress on the math challenges. Video - students will earn EPs for the quality of your Flipgrid video. To earn the most EPs as possible, students should speak clearly, look directly at the camera, and make sure they provide a detailed response to the weekly question that their DSU Math Mentor asks them. In addition to the points students can earn, the DSU Math Mentors will also be earning EPs. The DSU Math Mentors will be completing online math activities and earning EPs for their work as well.